In life, there are plenty of things that we only start to appreciate once they’re gone. One of these things is having a well-organized, clean closet. Once the clutter begins to set in, there is no stop to it. You’ll find yourself with a closet filled with piles of clothes and even start piling your other clothes, clean or not on other things such as chairs. This kind of mess can lead to your bedroom looking like it was ravaged by a tornado. With that said, as with all of life’s problems, there’s always a solution! Seeing how so many people take their closets for granted, they don’t seem to invest much into a custom closet system that can fit their needs and save the space. While organizing one’s closet can be a daunting task at first, it’s better to do it sooner than later as it’ll only get progressively worse as more and more clothes are added. Eliminating clutter should be your top priority, and that’s where closet storage systems start to play a significant role. Here are five of our top picks for closet storage systems. Without further ado, let us get into the list. 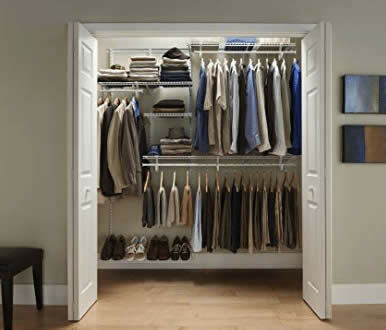 Trying to solve the issue of space in your closet does not necessarily imply that you need a bigger closet. Sometimes, you need to be smart about how you store your clothes. 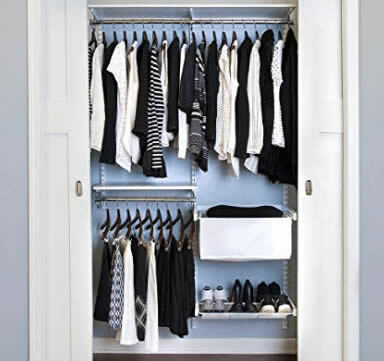 There are plenty of ways you can sort through your wardrobe and store your clothes. However, in order to get the most out of your closet space, you are probably going to need to make use of some special tools. This is where the Rubbermaid Configurations Deluxe Custom Closet Organizer System Kit comes in to save the day. This kit includes just about everything that you need in order to optimize your closet’s space. This kit can be easily installed and can be put in about any reach-in or walk-in closet that has a 4-8 ft wide wall. This means that you have a lot of freedom when it comes to how you can manage your closet space. 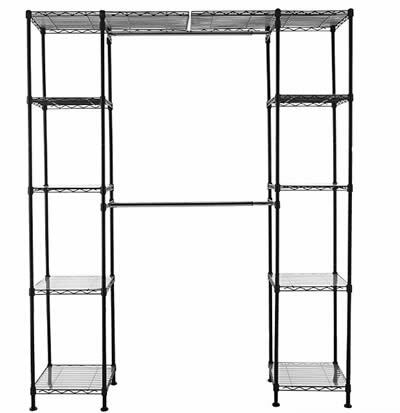 The expanding shelves and telescoping rods can be adjusted to your preference and can offer up to 22 ft of additional shelf space along with a 12 ft of hanging space. These features allow for so much flexibility and are overall very good to have. This coupled with the ease of the installation process and the fact that this kit does not require any maintenance thanks to the epoxy finish it comes with make it a very viable option. The ClosetMaid 22875 Adjustable Closet Organizer Kit is a comprehensive organizer kit that gives you a lot of options when it comes to organizing your closet. This kit comes with wire shelving, support road, closet rod as well as brackets along with the necessary tools to make the installation process a breeze. It also comes with instructions on how to set it up. You also won’t need to make to any additional cuts or trims so you can start using this kit as soon as possible. Another very nifty feature is the adjustable shelves that can add up to 216 inches of shelf space and 132 inches of hanging space. There’s a lot to like about this great kit. Being able to gain so much space and also have so much freedom will help you maintain a tidy and clean closet. When it comes to which cabinets you can use this system in, you can fit it into any cabinet that’s between 2 and 8 feet. You can also add more accessories – such as hanging baskets, shelf liners, stacking shelves, and a lot of other accessories – so you can customize your closet even more. 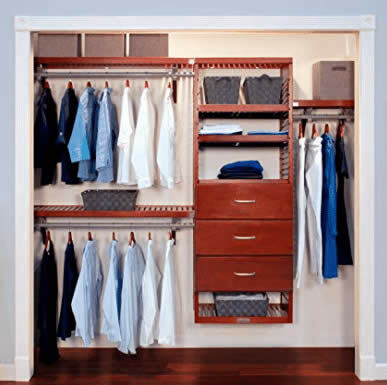 The Organized Living freedomRail Premium Adjustable Closet Kit is designed with customizability as the main feature. It’s durable, versatile, and very functional. You’ll also be pleasantly surprised to hear that you won’t need to use any tools in order to make adjustments. The amount of choice that this kit offers is among the best on the market. All of the shelves and baskets are movable so you can switch up your closet’s look if you ever get bored of the same look. Another advantage of being so customizable is the fact that you can optimize space to extreme degrees. Your creativity is the only limit. Another thing that’s very good about this kit is the fact that the rods and rails are made mostly from steel which means that they’re stronger than some of the other packages. Last but not least, this closet system can hold up to 100 pounds, so you don’t ever have to worry about its hold capacity, which is great for storing winter coats! Being the most expensive item on this list, The John Louis Home 16in. Deep Deluxe Organizer 3 Drawers’ price can be justified by a lot of cool features. The first thing that comes to mind is how much space it offers.It comes with 3 10-inch drawers as well as ample shelving space. With this storage solution, you’ll be able to organize your closet to your heart’s content. Disorganized closets will be a thing of the past. In fact, the impressive amount of space this kit offers makes it useful in many situations. You can use it in the children’s bedroom, the nursery, and a lot of other places. What is also great about The John Louis Home 16in. Deep Deluxe Organizer 3 Drawers is that it looks elegant and stylish, so you’ll be able to organize your closet as well as embellish it. Offering 22ft of space, you have the freedom to organize your clothes in any way you see fit. Last but not least, there’s the AmazonBasics Expandable Closet Organizer which is an affordable storage solution for your closet with a lot to like. One of the great things about it is that it is an expandable closet organizer which makes it versatile. It’s also quite reliable, being made with steel wire construction and is available in bronze, black or chrome finish. Additionally, the extra wide leveling feet make it much more stable. It also comes with hardware for wall mounting. When it comes to the organization side of things, there are two hanging rods that you can adjust by moving up or down. There are also five adjustable height shelves on each side for a total of 10. Each one of these shelves can hold up to 100 pounds which should be more than enough to freely organize your clothes. You’ll also be pleasantly surprised to hear that the assembly process is not very time consuming as it mainly consists of screwing the different parts together. This closet organizer also comes with plastic shelf liners as well as a 1 year of limited warranty. Having a stable organizational system is imperative to owning to clean and tidy closet. A good closet system will allow you to optimize your closet space in a way that makes it able to accommodate everything you already have. Don’t underestimate the importance of having an organized closet. Aside from the obvious advantages of saving time and eliminating clutter, having an organized closet will also make you feel better and more relaxed in general. The sight of a pile of clothes stacked on top of each other will have an adverse impact on anyone no matter who they are, so it’s best not to let things pile up in your closet until it becomes an eyesore. If you are handy with tools, can follow instructions and fancy building your own closet system, take a look at this great video which shows you step by step how to make a great closet system in no time. How many times have you looked at your closet and felt unproductive just because everything is crammed inside? A lot, we bet. Such a situation can be easily avoided by getting one of the best closet systems that we reviewed above. What are you waiting for? Your well-organized home is just a few clicks away!